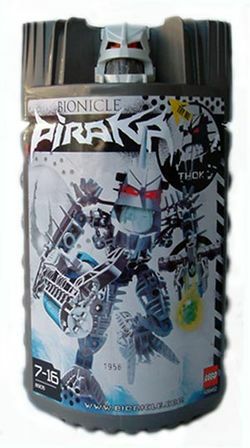 8905 Thok is a BIONICLE set released in early 2006. It contains Thok, who was a Piraka. He was armed with an ice gun, and was once part of the Dark Hunters organization. After he left the Dark Hunters he went to Voya Nui to find the Mask of Life. This is a description taken from LEGO.com. Please do not modify it. (see an archive of the product's page) Brilliant and evil! Thok's plan is simple - convince all the other Piraka he is on their side, and then betray them all! He has the power to bring inanimate objects to life to serve him and spellbinder vision to disorient a foe. If those fail, he relies on his ice peg and ice gun to freeze enemies and his zamor spheres to make them slaves. Includes zamor spheres and launcher! Thok is often known as "The Drifter." Thok belongs to a species called Skakdi.